A new year, a new reason to try something new! I’m kicking off 2012 with drinking Oatly oat drinks whenever I can all through January. There’s so many people who are dairy intolerent – and going dairy-free or changing any aspect of your diet can be challenging with all that there is to learn with regards to ingredients, nutrition, label-reading and cooking techniques. I’m already a fan of Soya milk but when I saw Oatly, a ‘milk’ made from soaking oats in water, I was really excited about this product. The packaging looked appealing and the healthy side of it was appealing. This drink contains all the goodness of oats. It’s cholesterol free, low in saturated fats and contains only 3 grams of added sugar and contains oat fibre which, when eaten as part of a healthy diet, can help to lower your cholesterol – Healthy Cindz here I come! Oatly is very watery and had quite a chalky taste – first sips I didn’t like it and would have preferred it being a bit thicker in texture and having a richer taste, I poured the stuff on some of my morning cereal, the sugar in the cereal helped to give the drink more of a taste (my sweet tooth kicks in!) and have used it to make porridge. It also states it can be heated up but it does not tell you how long to heat it up or basically how! So I do think that should be added to the packaging as I would quite like to try it hot and it also tells me on their website, you can use it in cooking and baking. When cooking with it, just substitute it for ordinary milk – the quantities are the same. I’ve not used it in baking yet but will give it a go soon. I’ve introduced the stuff to my parents, which at their age is more careful about what they eat and drink, however both aren’t too keen on the taste – it’s harder to change their tastes though! Milk, the creamy white beverage is a staple item in almost every refrigerator but Oatly’s packaging brings a drop of unexpected playfulness to the label and the liquid contents. 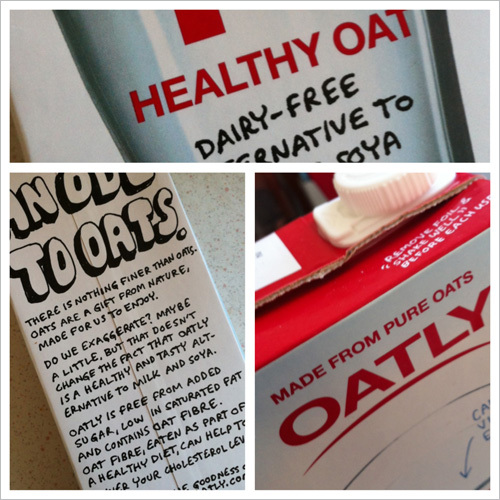 The clean and simple design of their carton hint at a smooth and succulent taste within – carrying panels of hand written text supported with doodles, encompass a very comical approach to their packaging, extolling the virtues of oats and their goodness – a lovely example of handwritten text used as design elements. 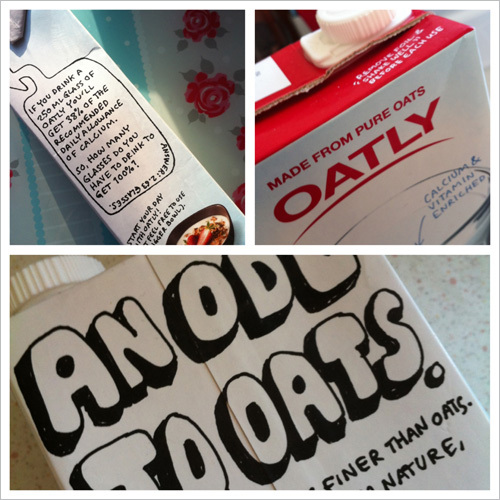 The Oatly branding, from their charming cartons and user-friendly, colourful website with lots of information for me to understand more about the benefits of the oat drink and supporting recipes, bring a delightful, endearing appearance to otherwise adventurous products. As a designer, handwritten typefaces are the kind of fonts that are brilliant if you need to spice up your designs and shouldn’t be missing in your font collection. Oatly drinks are also available in smaller cartons (250ml) in chocolate flavour makes it a great size for handbags and lunch boxes, very convenient. At £1.40 for a 1 litre carton could be a bit beyond people’s reach if bought on a daily basis. Product reviews: I’m really keen to try new things in 2012. I accept foodie treats and gadgets – anything shiny and tasteful for review and will review honestly, so feel free to send anything but don’t expect me to love them just because you might. I like to write and share things that I really love and have found interesting and that are relevant to readers of this blog. Please drop me an email and I would be happy to review your product.